A community of artists and entrepreneurs seeks a simpler life on London's waterways. Stretching from Little Venice in the west to Limehouse in the East, this 8-mile waterway is undoubtedly London’s most important. The largest of London's subterranean rivers and once a mad, bad center of London life. This legendary stone is of unknown origin, and throughout history has been a literal touchstone for British leaders. "Purveyors of traditional sweets and vintage treats." Carved out at the beginning of the 19th century under the auspices of the acclaimed John Nash, it was, like so many architectural projects, overambitious and over-budget. It did see plenty of use in its first 100 years though, before it suffered the same decline as the rest of the country’s canals in the early twentieth century with the rise of rail, and later road haulage. After narrowly dodging conversion into a railway, it limped through to World War II where it saw an increase in traffic as rail lines became overloaded. The closure of the Regents Canal Dock in 1969 effectively ended the canal’s era of trade. By the 1970s its use was solely for leisure and today it remains a beautiful and serene way to walk (or cycle) between a number of London’s boroughs. Since then, a community of houseboaters, drawn by potential economic advantages and the allure of an untethered lifestyle, has sprung up to take advantage of the canal’s strategic location. 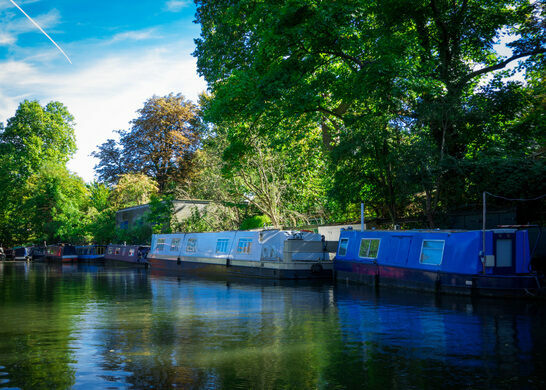 Information is scant as to when, exactly, London’s houseboat population began to grow, but today the Residential Boat Owners Association estimates that as many as 15,000 people now call Great Britain’s waterways home. Some lead lives as continuous cruisers, traveling from one location to the next without docking anywhere for more than two weeks at a time, while others opt for the stability of a mooring license, allowing them to rent a permanent space to dock their vessel. Depending on the type of boat, these homes can double as transport vehicles for running errands or simply enjoying an evening cruise, while others, lacking motors, remain stationary and serve exclusively as floating residences. Liveaboards, as houseboat-dwellers are called, cite freedom, economic advantages, a strong sense of community, and a closeness with nature as reasons for making their home on the water; many can’t imagine returning to a landlocked life. The canal is part of London’s intricate network of canals, basins, locks, and marinas. 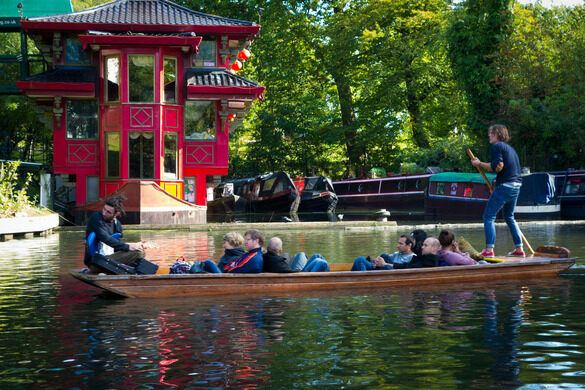 Inhabitants and travelers along the Regents Canal have easy access to amenities and attractions such as Little Venice, the Kings Cross Railway Station, the London Zoo, Regents Park, and Camden Market, among others. Should residents decide it’s time to drop anchor elsewhere, the canal also provides access to other important waterways such as the Paddington Branch and the River Thames. If you pass through the Camden section look out for the site of one of London’s most heated graffiti wars - in 2009 Banksy covered most of local legend King Robbo’s 1985 piece with a stencil of a workman pasting up wallpaper, resulting in a huge backlash. A Victorian school for poverty stricken waifs has been preserved as a museum to their donated education. A historic London cemetery now serves as a nature park incorporating gravestones & memorial statues. This East End pub gained notoriety as the site where gangster Ronnie Kray publicly shot a rival. This small town in the Netherlands has no roads but instead, miles of canals and over 100 bridges. Landbridge created by the South Korean version of Moses.